Corbeau Reclining Seat - Trailcat UNIVERSAL - Pann Auto Performance - San Diego largest aftermarket automotive performance parts - What do you drive? The all-new Trailcat seat is the latest and greatest from Corbeau. The Trailcat is unique in that it is truly a seat for all vehicles. The low thigh bolsters make it great for lifted vehicles like Jeeps because of the ease of getting in and out of the vehicle. At the same time, the kidney bolsters are still aggressive enough to hold you in place and eliminate body shifting while driving. The Trailcat comes in two different stitch patterns, including a diamond stitch, allowing you to select the pattern that best matches the look you’re after for your interior. You can also select between white or black stitching. This seat features top of the line injection molded foam, strategically placed bolsters, and harness belt capability. 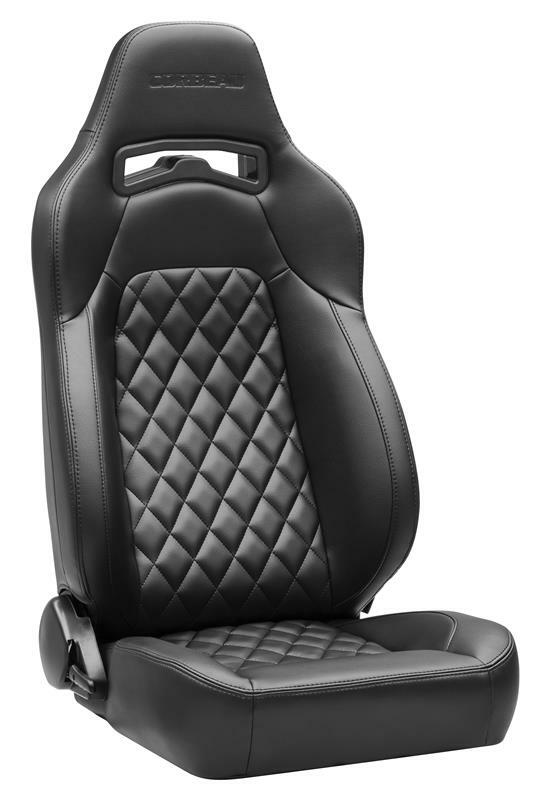 As with all Corbeau seats, you will not be disappointed with the comfort. The foam density coupled with the bolster placements, makes this seat second to none in comfort. As a rule of thumb the Trailcat will fit up to a 38-40 inch waist. Be sure to click on the bottom thumbnail image to get a better idea of the different stitch patterns and materials available for this seat.